Here’s a quick timeline on today’s surgery. Times are approximate (no, I didn’t stop to type the blog as actual events were happening). 5:40 a.m.: We leave the hotel and walk the 0.4 miles to Mays Clinic at MD Anderson. Surgery is on the fourth floor. 6:15 a.m.: They call Jenny back and begin pre-op procedures — questions and a change of clothes (including knee-high stockings and warm socks — we will find out where to purchase these). 6:40 a.m.: Jenny’s parents arrive and are able to give her a hug before surgery. In the pre-op room, only one visitor can be in there at a time. Linda and Bill get a turn to be with her, and then I get to go back. 6:45 a.m.: Jenny is starting to get nervous. She’s very strong woman — really, really brave. But she’s also an emotional woman. The nurse helps comfort Jenny by telling her, among other things, “I know, honey. You don’t have time for this. We’re going to do this and you can get back to your kids. You ain’t got time for this.” Of course, it was very appropriate of me to think of Sweet Brown … “Ain’t nobody got time for that.“ (Oklahoma City friends will know the meaning of this one). 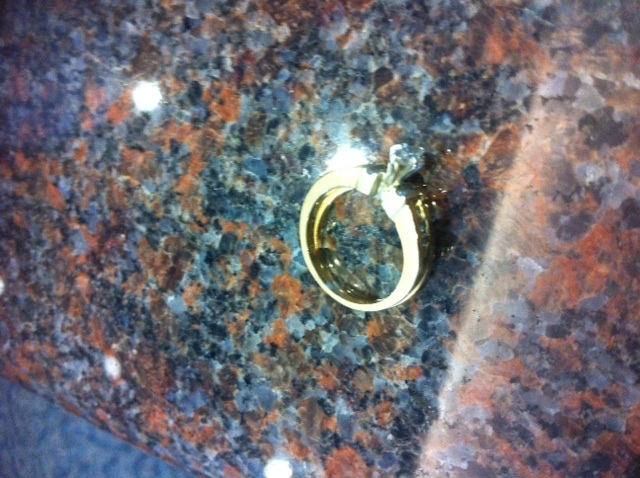 6:50 a.m.: I get to hold her wedding ring. It’s the only thing she had on her that she still needs to remove. It’s an odd feeling holding her ring for her. I don’t much care for it. 7 a.m.: Dr. Gainer, the primary surgeon comes in. She looks even younger when she is dressed for surgery. She brings a new wave of calm into the room. She’s confident. 7:10 a.m.: Time for the big hug, they say. Jenny is going to be loopy in a minute, so she won’t remember anything after that. So I get to give Jenny one more big hug from me and from all of #TeamJenny. 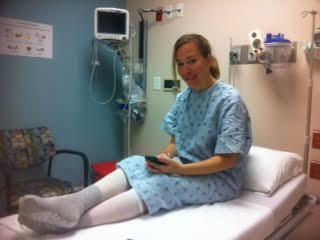 7:15 a.m.: The anesthesiologist begins work on Jenny. He knocks the edge off, and then after a few minutes asks how many drinks it takes for Jenny to start to feel the effects of alcohol. (I’m still there to make sure she’s telling the truth.) What he gave her wasn’t enough, maybe? That’s my Jenny. 7:20 a.m.: Jenny admits to being apprehensive about what she might tell the doctors as the drugs kick in. The anesthesiologist says he rarely hears anything too good, except for when an Air Force One pilot was his patient. The anesthesiologist is now privy to national secrets, apparently. 7:25 a.m.: The anesthesiologist politely says, “Thank you.” That’s my cue to leave. It’s off to the waiting room. Dr. Gainer will be finding me after her part of the surgery is complete. That will be in a couple of hours. In the meantime, I busy myself with breakfast, coffee, Facebook, email and starting to type this post. For me, staying busy is a good thing. And Jenny’s parents are great company. 10:05 a.m.: Dr. Gainer comes into the waiting room to give us a great report. Her part of the surgery is complete, and the sentinel lymph nodes she removed were biopsied and tested negative. Woo Hoo! 11:10 a.m.: Dr. Kronowitz emerges. He’s not as enthusiastic as Dr. Gainer. He’s very serious and direct. He says the expanders look good. He did offer this insight: “She (Dr. Gainer) was worried about it, but it’s fine. As a plastic surgeon, it’s good that the surgeon is worried about the skin she leaves.” And with that, his chit-chat was over. He said we’ll wait an hour for her to wake up, then I can see her. 12 p.m.: A report from a nice gentleman manning the waiting room … “She’s sound asleep — very peaceful.” Great, but I’m impatient now. And Jenny hasn’t been able to sleep in for 11 years. She likes to sleep. She might take advantage of this opportunity. This could be a while. 12:15 p.m.: After a little persistence and passive-aggressively hovering around the front desk, I get to go back to see Jenny. She’s not feeling so good. She’s in a lot of pain. But she likes the drinks of water. “It’s the best water ever,” she whispers. She asks about the results. But she’s so drowsy and in so much pain that the good news barely registers. She doesn’t feel good at all. That part isn’t very much fun. Even the mention of bacon doesn’t make her feel better — and if you know Jenny, that means she’s really not feeling well. 2 p.m.: Jenny is able to walk about 30 yards to her overnight room, where she eats lunch and gets some stronger pain meds that will last a lot longer. She’s still in quite a bit of pain, but is able to rest more comfortably. This is a good step. She has more color to her face and is looking forward to crashing when the pain meds take over. 2:45 p.m.: Jenny’s parents arrive in the room after getting a bite to eat. I retrieve her pillow pet with all the prayers and thoughts attached to them, and then I get something to eat myself. 3:15 p.m.: I get back to the room, and Jenny is much more perky and asking about what she said prior to being knocked out. She doesn’t remember any of it. Most of what I told her was accurate. The rest of what I told her was just to mess with her. She’s able to joke a bit, so that’s great to see. 4 p.m.: She’s still in quite a bit of pain, so she gets some morphine. That, and being able to shut the door for a while, allows Jenny to get some good rest. She sleeps for about an hour and a half. She is still in discomfort when she wakes up. This is just the way it’s going to be for a while. 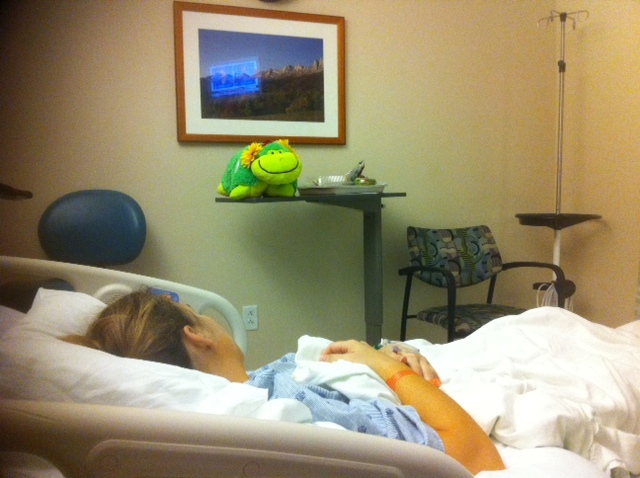 Jenny resting with her pillow pet of prayers in the background. We are supposed to be released in the morning. We’ll go back to the hotel to recover until a follow-up appointment on Thursday. If all goes according to plan, we’ll be driving back to Edmond on Friday. She’ll recover more through the next week, and then we’ll return to Houston for results of the pathology report and to hear the recommended next steps in the treatment plan. Dr. Gainer and Dr. Moulder (the oncologist) will lay out the plan on Nov. 15. Thank you for your prayers and the positive thoughts and messages. It’s really been great. I actually can feel lifted up by our friends and family. We are both stronger in the fight because of all the support beneath us. This entry was posted in Surgery by Alan. Bookmark the permalink. Just shoving more love your way. Tried to think of something funny, but I’m too grateful it went well to make jokes right now. Imagine that. Alan, thank you for taking care of Jenny. You are the perfect mate for her and I really enjoy seeing the love you guys share. I love the Herzberger family! Give her a hug for me. So glad we are on our way to recovery. Thanks Alan for the recap. It helps to know the details. We wish we could be there with you guys. Tell Jenny to get some good rest. You guys will be in our thoughts and prayers. I’m SO glad the biopsy turned out well and that she is resting. We are continuing to pray that recovery goes smoothly and with less pain. I really appreciate the updates. We are so happy that Jenny is doing well. You’ll make a good nurse. Just wanted to tell you, that you and Jen have been in our thoughts all day. You are a wonderful man Alan, Jen is so lucky to have you by her side. And I think you’re lucky to have found this smart, strong and wonderful woman. UNBEATABLE TEAM! Sorry, please indulge the mush for a moment. 🙂 Chin up and feel the love coming your way from your Lawton family. Our Jenny is on her way, and the support, thoughts and prayers coming from #Team Jenny will help her down that road to the finish line. You guys are amazing. We thank you from the bottom of our hearts. So great to see that she is out of surgery and can now focus on recovery. Continued prayers for you and your family! Thank you for the update, Alan! We’ve been thinking about her a lot at Koch Comm. Stay strong down there! Keep the Faith. Stay strong. Hey, Alan thinking about you guys, our small group prayed for you all. Thank you for your blog post. I am so happy that everything went well and that Jenny came through surgery without a hitch. I thought about you both all day yesterday. Hugs and love to you both! Thanks for the good news Alan. Bet wishes and love to both of you. These comments always make me misty. Thank you for taking care of our girl, Alan. As I’ve said before, we are so grateful she has you. Love to you both. We are so thankful for the good report and the medical team. I’ve never seen such team work from the families and medical team. Team work, Team work. Our thoughts and prayers are with you all.